Machine learning is a type of artificial intelligence that allows computer programs to learn when exposed to new data without being programmed. 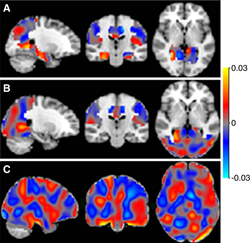 Now, researchers in The Netherlands have coupled machine learning methods with a special MRI technique that measures the perfusion, or tissue absorption rate, of blood throughout the brain to detect early forms of dementia, such as mild cognitive impairment, according to a new study published online, July 6, in the journal Radiology. ASL MRI can identify brain changes that appear early in disease process, when there’s a window of opportunity for intervention. The study group included 100 patients diagnosed with probable Alzheimer’s disease, 60 patients with mild cognitive impairment (MCI) and 100 patients with subjective cognitive decline (SCD), and 26 healthy controls. “ASL is a promising alternative functional biomarker for the early diagnosis of Alzheimer’s disease,” Dr. Meije Wink said. “Application of Machine Learning to Arterial Spin Labeling in Mild Cognitive Impairment and Alzheimer Disease.” Collaborating with Dr. Meije Wink were Lyduine E. Collij, B.Sc., Fiona Heeman, B.Sc., Joost P. A. Kuijer, Ph.D., Rik Ossenkoppele, Ph.D., Marije R. Benedictus, Ph.D., Christiane Möller, Ph.D., Sander C. J. Verfaillie, M.Sc., Ernesto J. Sanz-Arigita, Ph.D., Bart N. M. van Berckel, Prof. M.D., Ph.D., Wiesje M. van der Flier, Prof. Ph.D., Philip Scheltens, Prof. M.D., Ph.D., and Frederik Barkhof, Prof. M.D., Ph.D.